Schlüter-BEKOTEC-THERM can be specified with heights starting as low as 20mm before floor covering. This means that the system is suitable for both new-build and refurbishment projects. The BEKOTEC-THERM system is considerably lighter than conventional heated screeds. A reduction of 37mm in screed thickness saves 3.7m3 of screed mortar (equivalent to a 7.4 ton saving over an area of 100m2). The small screed mass and proximity of the heating pipes to the surface means that the system is quick to respond, and therefore more energy-efficient. 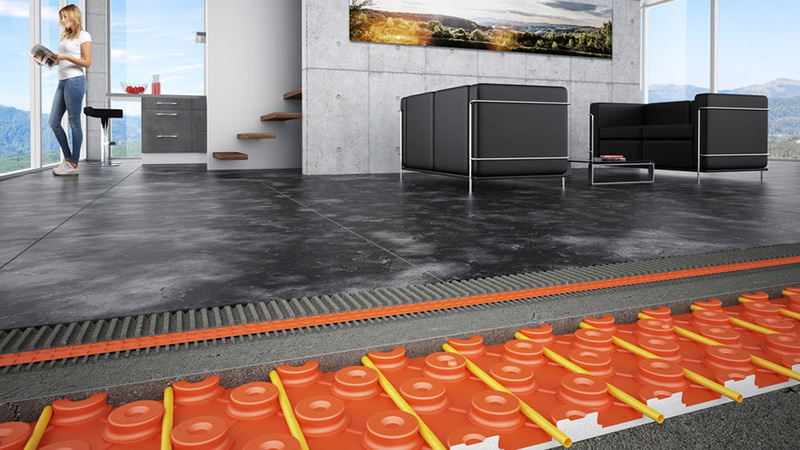 The system is based on the Schlüter-BEKOTEC family of lightweight modular screed systems. The studded pattern of the panels prevents buckling of the screed; this in turn avoids the build-up of tension. As a result, no screed joints are required in a floor assembly using the BEKOTEC system. Paired with the Schlüter-DITRA 25 uncoupling membrane, the system prevents stresses from transferring to the covering. The overall result is a long-term crack-free finish. The four weeks that a traditional screed takes to dry and cure are reduced to just 1-2 days when using BEKOTEC. The DITRA 25 uncoupling membrane can be installed as soon as the screed is ready to bear weight, followed by the tile or stone covering. These factors result in quicker progression and less disruption to the project as a whole. When it comes to putting the system into operation, warm-up heating can be started at 25⁰C and increased by 5⁰C per day until the desired system temperature is reached. Reduced screed mass means that the system can run at lower temperatures of around 30⁰C (vs. up to 50⁰C with traditional screeds). The lower supply temperatures mean that the system is a great match for renewable energy sources, such as ground and air source heat pumps. Using existing floor plans and project heat calculations, we are able to provide a design for your project and make sure we can achieve room temperatures. Easy to install dry-pack screed with extremely low tension, for interior and exterior use. Specifically developed for creating floating screeds (and bonded screeds) for Schlüter-BEKOTEC systems. Flowable self-levelling screed with extremely low tension, designed exclusively for use in interior spaces. Specifically developed for creating floating screeds for Schlüter-BEKOTEC floor assemblies.